The reason we had come to Gaborone was not to tour Jonmol Bicycle Services, visit Bones, or even to check in for a face-to-face update. 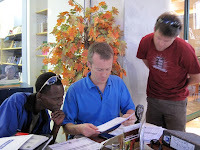 We had made this excursion on our Africa trip to try to identify the challenges he was having with his shop after a year of existence, and to do that best that we could to help him solve the problems and become self-sufficient. During our look around the place, we talked with Bones and Jerry about some of the difficulties they were having at the shop. The first thing on our minds was to get a sign out front as soon as possible. After a little nosing around, we found the old sign that we had made for the shipping container which had brought so many people to Bones' shop while we had unloaded and set up last year. Arrangements were made immediately with his landlord and a metalworker next door to mount the sign at the entrance to the alley. One down. In the front room, there was a new 16" kids' bike that had come with a tire that had a huge gash in it. Since the only distributor available to him was out of that size, Bones was stuck with the bike as dead inventory. We'll help by sending some of the tires with our next container of donation bikes, but that will take time to get to him. He also had repair bikes requiring 27" tires that were stuck in limbo because of the same supply problem, which again we pledged to help supply them during the container shipment. These issues with his distributor brought us into a conversation of stocking levels with Bones. We stressed to him that since he now had a little capital from the sale of the donation bikes, he would need to identify parts that he did not have in advance of needing them whenever possible, so that he could order when the distributor had stock and not be stuck when they did not. We helped him get together want-lists and assisted with some rudimentary stock planning and scheduling. This way he would be best equipped to keep the bikes in Gabs rolling with the service they needed. This was the only way for the bikes to be of use to their owners, thereby making them a viable transportation option for the people of Gabs. After seeing the defective tire on the kids' bike, we did a little survey of what bikes Bones had for sale. 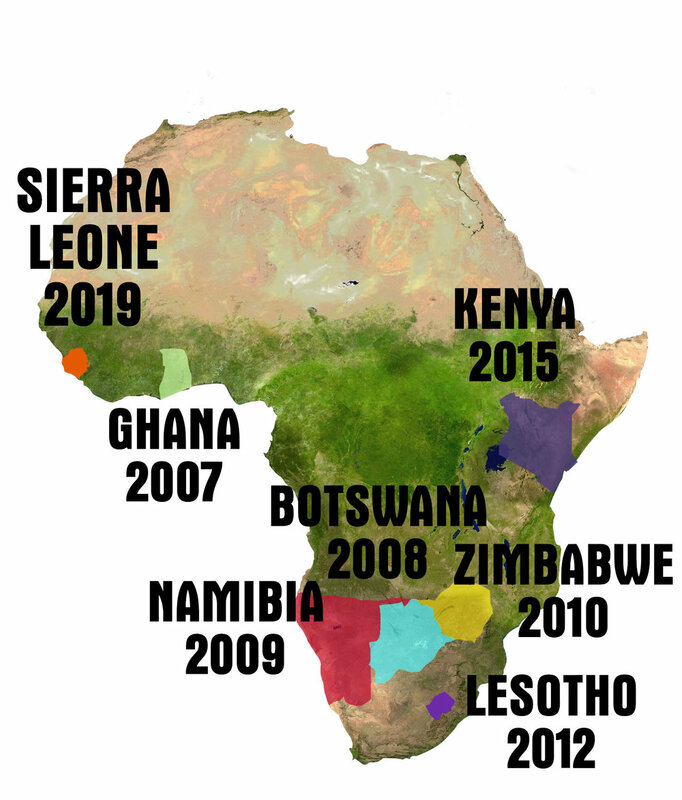 The good news was that he had sold completely through the entire lot of 404 donation bikes from our first bike drive, which is extremely gratifying because it literally means there are over 400 more cyclists in Gabs than there were before our Africa Bike Drive. The bad news was that distributor limitations and costs meant that Bones' bicycle stock was now fairly low and priced higher than the original load of second-hand bikes. He had about six kids' bikes in stock, which he told us would likely move quickly with the Christmas season approaching. All of them were leaned up against each other, untuned, and with cardboard and bubble wrap all over them. His most basic adult bike was a Raleigh Rhino, which was an ideal bike for Gabs, because it was less expensive than almost anything else available and was very durable and useful with its single-speed drivetrain and full fenders and rear cargo rack. In short, a very similar transportation bike to what you see in cities across the U.S. Bones had a couple of Rhinos in stock and also a few Raleighs that were a step up with full ranges of gears, aluminum frames, and front suspension. 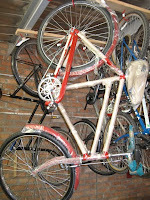 Not a one of them was in an acceptable state of tune, however, with packaging still attached, brakes, shifters, and handlebars improperly positioned and adjusted, and parked in corners of the back room or hanging up out of view. The final bikes we found in his stock were some Humber-style bikes from Raleigh, which are the classic full-fender heavy steel bikes that are popular in European city centers. These were quite beautiful, and almost as inexpensive as the Rhino, but one wouldn't have known they even existed because they were hanging up in a dark corner and wrapped up in packaging. Just a single one of Bones' entire stock of bikes was priced. At this point we felt we had to show Bones the importance of presenting his wares in such as to add value to them. He needed to have the people who walked through his door get excited about riding bikes, and to convince them that a bicycle was a better buy than a month's worth of cramped, slow, noisy, combi-van transit rides. I was surprised when the guys at Jonmol told me that in rapidly-developing Gaborone, a bicycle needed to not only appear to have value, but also needed to actually be seen as cool. This brought me back to the days before hipsters, when urban bike riding still had to overcome that ages-old 'cool' stigma. Ah, memories. To help with this, we brought Bones to the mall. Gaborone has indoor malls, and though most of the population can't afford to shop at them, everyone thinks that what is sold there is cool. Walking through the mall which looked very much like one or our malls in the States, we showed Bones the ways in which these stores presented their product to the buyer. Clean, shiny, front-and-center in bright window displays, and priced so that anyone would know the value of the products simply by looking at them. Over coffee at the mall, Ken and Matt went over Bones' financial records with him, and gave him lots of coaching from the retail 101 playbook. Supply-and-demand, profit-and-loss, how to control inventory and record wholesale costs and sales were all discussed. This was a lengthy talk, but we were pleased to learn that a business development representative from the government of Botswana had been mentoring Bones on running Jonmol in the recent months, and would continue to do so. His name was Boz and we would later have a fascinating meeting with him at the shop. 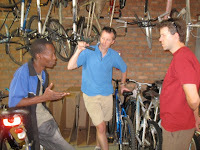 The whole purpose of our Africa Bike Drive project in the first place was to get Bones and Jonmol Bicycle Services to a place where they would be completely self-sufficient, and thereby enable the people of Gaborone to have a continuing and long-term source of bicycle transportation. After taking a hard look at the numbers, we were pleased to see that much progress had been made. But we learned that there was still a ways for Bones to go before he would be able to cover all of his costs. Since the container bikes had been sold, he was moving bicycles at the rate of just 10 per month. He would need to double or triple that to ensure the long-term viability of his shop, and we came away from the morning with the knowledge that at the very least many of the seeds of his success had been planted.